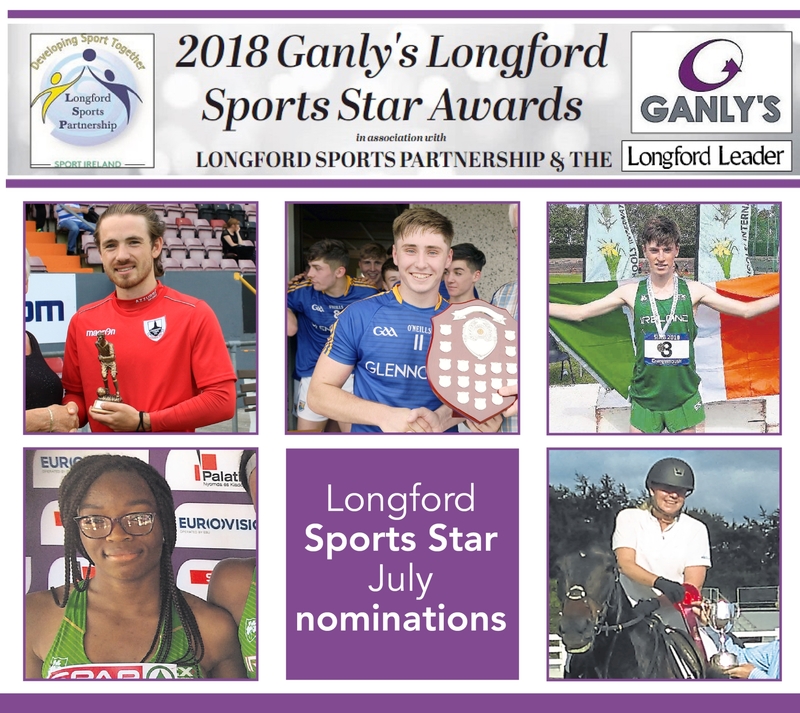 There are five contenders for the 2018 Ganly’s Longford Sports Star of the Month Award for July, in association with Longford Sports Partnership and the Longford Leader. Voting closes at 9pm on Wednesday, October 17. In the aftermath of the brilliant 5-1 win away to UCD, there was some more good news for Longford Town as their wing wizard Dylan McGlade was named the Airtricity League Player of the Week with the award selected from both the Premier and First Divisions. After producing a string of good performances, McGlade scored twice against the students at the Belfield Bowl in one of the shock results of the season. Talented Longford athlete Yemi Talabi was part of the Irish Girls Medley Relay team that just missed out on qualifying for the final of their event at the European U-18 Athletics Championships in Gyor, Hungary, finishing fourth in their heat and tenth overall in a time of 2:13.64. Longford Athletic Club member Yemi ran the 100 metres opening leg of the relay in representing Ireland with a lot of distinction. A tremendous start laid the foundations for the Longford U-17s richly deserved 1-13 to 0-11 victory over Dublin in the Leinster Minor Football Shield Final at Glennon Brothers Pearse Park. There were a number of very good performances, led by inspirational captain Eoghan McCormack, and the tenacious Carrickedmond lad was a real driving force at centre-half-forward in giving the entire team a great lift. Longford’s running star Cian McPhillips (Moyne Community School), representing the Irish Schools team, was again in the spotlight when winning the Boys 1,500m race in 4:04 at the SIAB Schools Track and Field International in Grangemouth, Scotland. Cian produced another superb performance in July in setting a new Irish Youth (Under 18) Outdoor 3,000m record when winning the race in the time of 8 minutes and 18 seconds at the Irish Milers Club Meet at the Irishtown Stadium in Dublin. The Longford Athletic club member broke the existing record for the distance which had stood for an incredible 44 years, held by the great John Treacy after his tremendous run in Edinburgh back in 1974. Nine members of Mosstown Riding Club attended the National Show Jumping Championships held in Mullingar on Sunday, July 8. Following on from their success in the prestigious TRI Equestrian Team Show Jumping Challenge at the 2018 AIRC Festival in Mullingar Equestrian, the Mosstown contingent travelled to the event in confidence. In the Advanced Primary Section, Mosstown's Emer O'Donnell and Ruth Harrison both qualified for the final of the SJ Championships, with Emer emerging victorious and being crowned Advanced Primary National Show Jumping Champion.